Tarpon Springs is a historic small city of 24,000 inhabitants with an unusual mix of Greek culture, and Victorian and Floridian architecture. Incorporated in 1887, it is the oldest city in Pinellas County, Florida. Located on the Gulf of Mexico on the west coast of Florida, Tarpon Springs is north and west of the Tampa-St. Petersburg metropolitan area. The city is full of parks, public art, bayous and brick streets, and boasts two distinct downtowns: The original downtown area, which is a mix of antique shops, boutiques, galleries, and museums, is listed in the National Register of Historic Places. Second, the internationally renowned Sponge Docks is a traditional Greek sponge fishing enclave, settled in the 1800s, that has grown into a tourist mecca. 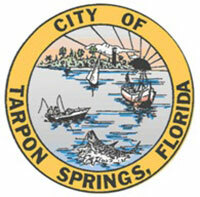 The Tarpon Springs Public Library, founded in 1916, is a division of the city’s Department of Cultural and Civic Services.